Morris Lessmore, the short film by Moonbot Studios is now an iPad app that shines with vivid graphics and entertaining interactivity never seen before in iOS book applications. William Joyce is the creator of the book and has a deep resume filled with book animation and most notably working with Pixar on Toy Story & A Bug’s Life and with Fox Studios on Robots. The story of the Fantastic Flying Book of Mr. Morris was based on the lives of two real world characters that had given their lives to books and children’s story telling and inspired by Hurricane Katrina. The iPad app utilizes computer animation, stop motion, and 2D animation and brings those aspects into an magical digital iPad book that will delight and engage any child or grown-up. The experience of reading this eBook is unlike any other book I’ve seen to date. Having won a series of awards already, it’s no surprise that the Morris app on the iPad is also worthy of the same recognition. 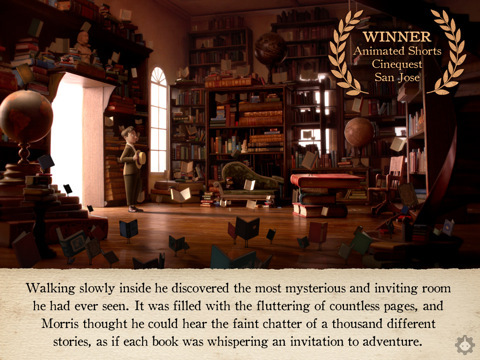 William Joyce and his colleague Brandon Oldenburg bring the story of Morris Lessmore to life with captivating storytelling and real world sets created for this project. The tone of the animations change from black and white silent film style to crisp Pixar like graphics and are all narrated and soundtracked beautifully to create a dreamlike world that steps outside the bounds of traditional voice-over children’s books. The book itself is 27 digital pages and has various types of interactivity. If your child has never opened a book before and they experience Morris, they might just fall in love with reading instantly. You will flip the pages of the book and unfold the story while being fully engaged in the touch points of the various scenes. Draw on a book and watch as the letters fly away in the wind. Color the sky a magical happy blue, and play Pop! Goes the Weasel on a piano. 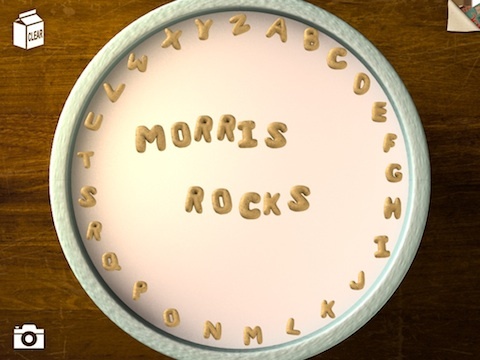 Oh and you can even play with the letters in your cereal to make words and snap a photo of it to store in your iPad’s Camera Roll. There is a gallery style table of contents for easy navigation. Reading can be fully customized in the Morris app as well. You can turn off everything from audio narration, soundtrack music, audio sound effects, and even the text of the book itself. Finally the app also gives you links to buy the short film on iTunes, and learn more about other books from Moonbot. Overall The Fantastic Flying Books of Mr. Morris Lessmore is a must experience app. The amount of work that has gone into building and creating the app is highly impressive. The story itself is quite touching and has a sweet feel good ending while fun to engage with. The price of the app is a bit high and for that price I was expecting the story to go on a bit further, but then again this is a children’s book. For those reasons alone I can’t give this app a full rating. Otherwise if you have the money to spend and are a fan of Pixar movies or digital shorts Morris is a must add book to your iPad collection. AppSafari review of The Fantastic Flying Books of Mr. Morris Lessmore was written by Joe Seifi on July 14th, 2011 and categorized under App Store, Books, Featured, Fun, iPad apps. Page viewed 7233 times, 1 so far today. Need help on using these apps? Please read the Help Page. Great production values, kids will love it!